India’s first industrial grade professional 3D printer with patented Advanced Fusion Plastic Modelling (AFPM) technology. The revolutionary AION 500 is a high performance, massive size 3D printer that offers a professional-level build volume at an affordable price point. Armed with our patented AFPM (Advanced Fusion Plastic Modeling) technology, the printer renders a stronger and durable output. With multiple connectivity options and sensors, it is one of the most advanced 3D printers available in India. Offering a large build size, ultra-fast print speeds, and unmatched precision, the AION 500 is designed for versatility. 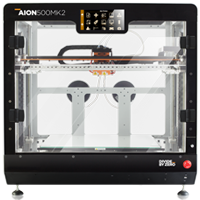 AION 500 is a fully enclosed industrial grade 3D printer and assures a consistently high print quality and repeatability. It features, the Quick Load functionality for changing and loading filaments easily, anti-clogging filament sensors and a super-slicer that makes sure there’s no time lost when the print is initiated - making it highly efficient and productive. The machine is easy to use allowing the user to alternate between quick-&- easy to professional-grade printing smoothly. From prototyping to low-volume manufacturing, the AION 500 excels at any design application with impeccable accuracy and cost-effectiveness. AION 500 is designed to add maximum value to professional work setups. Divide By Zero’s AION 500 MK2 sports a massive build chamber of 500mm*500mm*500mm, making it ideal for rapid prototyping along with low-volume batch manufacturing. The patented Advanced Fusion Plastic Modelling (AFPM) technology empowers users with the affordability of FDM 3D printing with a SLS-level print quality, thanks to its smart control over material flow and temperature of different layers. This ensures consistent form, fitment and accuracy in the printed output. Read more about AFPM. The AION 500 MK2 features a stable build platform and moving gantry along with the Z-axis motion electro-mechanically synchronized ball-screw transmission that boasts of a positional accuracy of 16 microns for precise print detail and quality. It features a hassle-free automatic print bed levelling functionality that empowers consistent repeatability and reprints. 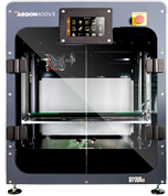 The AION 500 is housed in a high endurance and rigid 5mm sheet metal enclosed body that helps maintain stable chamber temperature for controlled heat dissipation leading to seamless adhesion and uniform print consistency. Despite being equipped with the patented AFPM technology and an industrial grade massive build volume, AION 500 is placed at an affordable price point and has a low running cost of (Rs. 6/gm), thus offering value for your money. 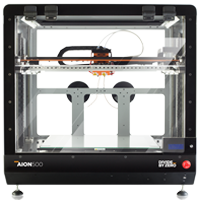 The AION 500 industrial grade 3D printer is compatible with a wide range of material such as ABS, PLA, TPU, Wood-infill, PETG, HIPS, Carbon Fiber, Polycarbonate and special AFPM- enhanced materials. This industrial grade 3D printer features a high-performance all metal direct drive dual extruder mechanism giving users the freedom of printing two different types or two different colours of the same materials simultaneously. Divide By Zero has incorporated a fast response filament sensor that continuously monitors and actively repairs extruder clogging, thereby ensuring zero failed prints and a high level of reliability in fast-paced prototyping and production environments. This large volume 3D printer can be easily connected to workstation via a USB cable. Apart from this, users have the opportunity to save files on SD card and print them directly in an instant. 12. What makes AION 500 an industrial grade 3D printer? AION 500 is a reliable machine that assures lesser downtime due to its efficiency, thus guaranteeing a high-quality product every time. This machine follows strict safety protocols to avoid any damage to the operator or to the vicinity and is non-polluting as well. Despite being well-equipped to handle complex prints, AION 500 is easy to use. There is no dependability on a technical expert and the time spent on training the new user is drastically reduced. The AION 500 MK2 is packed with safety features such as high-temperature software locks and continuously activated carbon filter air-purification system to absorb hazardous fumes generated during printing, ensuring a safer work environment for the user. Positional accuracy 16 micron using HIWIN High Precision Linear Guide Rails. Covered under 3 days free onsite training. DBZ is a quite young organization with energetic team and they really honor their commitments. DBZ has installed Aion 500 3D printer for design validation before investing in production tooling. The surface finish and accuracy of outputs are very good. Team DBZ provided thorough training and that’s we liked the most. Massive machine, built with international taste, with the precision and reliability. Surely it is 'The Machine' for the product designing industry. When I first looked at Divbyz, I thought : “I have never ever heard of these guys. I am not sure it this is going to be up to the mark”. Under no condition was I going to be purchasing this. However just for my inquisitive I enquired on the divbyz. And my God! The response and explanation from Gunichha was just marvelous. She had an answer for every question that I asked. Trust me, when I asked question the opposite guy would sweat to the core. Gunichha handled me impressively. All thanks to her for our business relationship to be a success. Imran you’re the best at what you do! First I am impressed with sales Department. So I came to your company and took a personal view on the product and team. Second the management and staff are very co-operative and are honest. Training went good. I am satisfied with Divbyz. I specially mention Gunichha an ascent to your company.